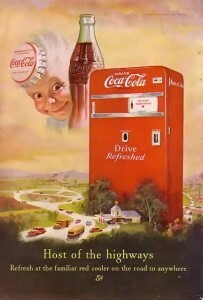 It does depict the Coca-Cola brand, in all its glory, after all, so It’s The Real Thing, by definition. And, unlike the very hypothetical scenario relied upon in the Wolf Appliance case, the above drive-in restaurant signage is real world and in current use, designed to attract attention, and has been for years, in fact, well after the business responsible for the sign dropped Coca-Cola for Pepsi. That’s right, “no Coke, Pepsi.” To twist Sean Penn’s words in I Am Sam, Wagner’s change was a “very bad choice,” at least in my humble opinion of taste. Last, it certainly is a good example of the Initial Interest Confusion doctrine at work. Minneapolis drivers on Highway 81 pull off the road for a great cheeseburger and a refreshing Coca-Cola, or in my case, Diet Coke. Only to find that there is no Diet Coke, or any Coca-Cola products for that matter, only Pepsi products. Drivers likely aren’t confused at the point of purchase, however, since the menu and interior soda fountain signage refer to Pepsi not Coke. Nevertheless, the exterior sign no doubt has steered more than a few thirsty types off the road over the years to end up purchasing Pepsi products, not Coca-Cola products. Not me, however, I’m not even initially confused any longer, just annoyed with the change, and deciding with each visit, well in advance, to enjoy a chocolate malt instead of a soft drink, since I can’t have the real thing any longer at Wagner’s Drive-In II. I’m not the first to say that, unlike a refreshing Coca-Cola® brand soft drink beverage product, this “detour of doom” argument leaves me flat. Lord, just show me a sign! First, there are more factual presumptions in this argument than there are bubbles in a frosty two-liter. The biggest, most carbonated one is that the sign is being left up on purpose, presumably because Coke reels the custom in parched carbohydrate-seekers off the old Interstate in a way Pepsi can only dream of. I find that hard to believe–it’s not as if Wagner here switched to some weird off-brand slop. It’s Pepsi, dude. In fact, the issues that face restaurant owners with respect to making the switch can be quite complex. But for a run of the mill roadside dive, it doesn’t seem likely that the Pepsi boys were prepared to not only pay for menu and interior signage changes, but pick up the freight to have the old Coke sign removed and replaced with the standard of the victor. How many cases of Pepsi exactly are the Wagners going to move here, after all? It seems likely that everyone just forgot about it–including the Coke folks, who were either planning, or at least hoping for, a reconquista against the uppity horde or, just as likely, just kind of forgot about it and engaged passively in a little ghost branding–and so it most likely went. 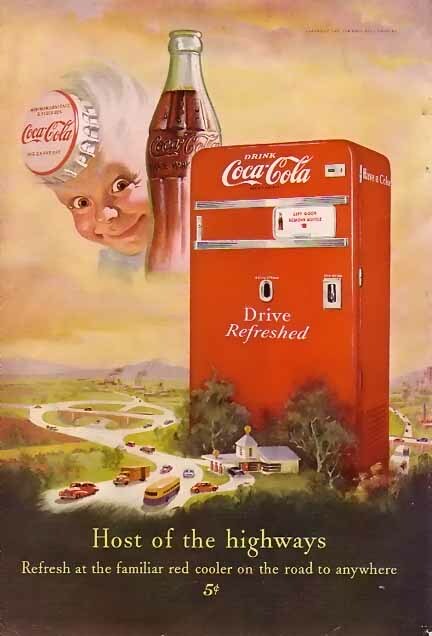 And then, really, how do we know how many thirsty travelers pulled over for a cold, stimulating Coke and a smile only to find themselves plunged into the Pepsi generation? “[T]he exterior sign no doubt has steered more than a few thirsty types off the road over the years to end up purchasing Pepsi products, not Coca-Cola products” is, again, exactly what I would expect to find in a typical Lanham Act opinion by a typical District Court judge these days [That’s a typical one! 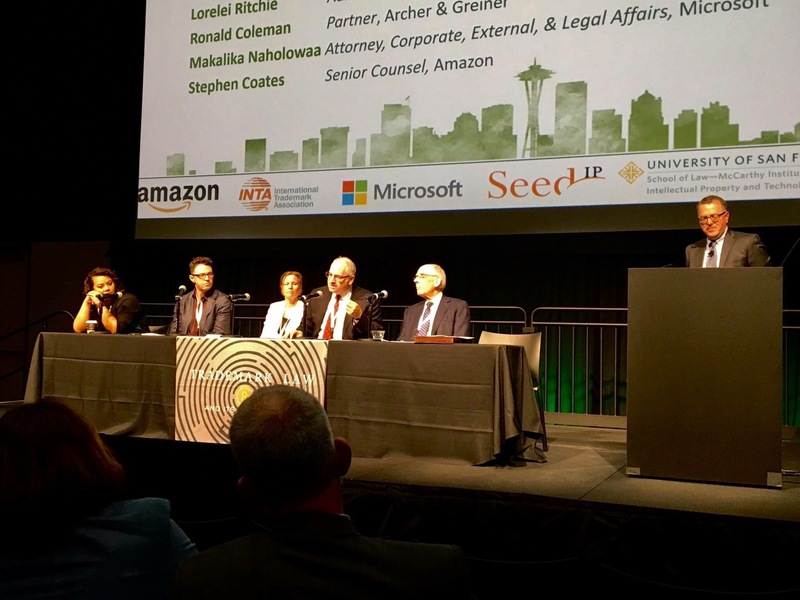 Not you, Your Honor!–RDC], but it ain’t why I’d call proof of harm, irreparable or otherwise. In fact, my insistence for rigor in proof of harm is almost besides the point, because guess what? 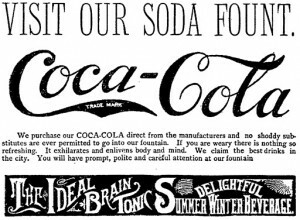 For all the awfulness of the thing, by all indications this patent lie repeated for years on the honest wayfarers of the Viking State obviously didn’t bother the Coca-Cola people a whit! In true ghost-branding fashion, they haven’t done a thing about it for all that time, and shy they’re not. Either they don’t care, or they’re thinking all things considered most people actually don’t stop at Wagner’s place, so they mainly still have a decent Coke branding beacon hitting the highway day and night… or… or … There’s no legal harm here! As in the de minimis non curat lex kind of thing! Having drunk all that in, there are also just plain trademarky, legal-doctrine-ish reasons for me to disagree with Steve, something I hate to do because he’s a great guy and he knows a lot about trademark law that I should know but don’t. But that’s never stopped me from courteously saying what I think, right? And as it happens I just said that here. Sorry Ron, I must disagree. 1. First of all, go back a bit in time. When Wagner’s was selling Coke, they put up a prominent sign saying so. In fact, the Coca-Cola part of it was (and still is) twice as large as the rest of the sign. Why did they do that? A fair inference is that they thought that would attract business — the sign says: “here is a place you can buy a Coke” and perhaps other food as well. Many people like Coke — it’s a national brand. It’s attractive to customers. So here you have an intent to use the sign to attract business through association with Coke. Of course, at the time, that was legitimate. But I think that does support the idea that such a sign and its message attracts customers to the restaurant. 2. True, later they were probably too lazy to bother changing the sign, or they just forgot. Not clear to me that “too lazy” or “I forgot” equates in law with unintentional. And even if it does, trademark infringement does not require intent. 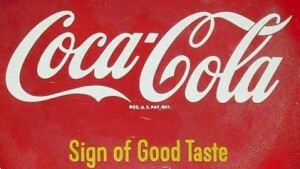 The fact of the matter is, the sign telegraphs a false statement — we have Coke for sale in our restaurant. 3. We can never know how many drivers have been misled or diverted by the sign. Where I come from, that supports an argument that the harm is irreparable — it is hard to assess and quantify. Indeed, you can say the same thing in many trademark and false advertising cases. How many customers bought the item because of the (false) trademark vs. how many bought the item because of the item itself? Very hard to tell in most cases. I agree this is not the most egregious trademark infringement case I have seen. But if Coke asked for the sign to be taken down, they would be entitled to that. Suppose they asked nicely and the owner refused. Would you deny Coke an injunction? 4. You have never answered this question: Do you think the Mobil Oil case was wrongly decided? In that context, a business context, the very fact that you get to meet someone and make a pitch is valuable. Most business-people don’t want to even see you. The Second Circuit held that using a confusing mark to give oneself credibility and get an initial meeting is actionable. Wrong? First, I am not nearly in the same league as you all, so please do not role your eyes so loudly as you read this. Seems to me that the logical explanation of the above is that Coke paid for the sign and thus dictated the relative sizes. It also seems to me that if Coke wanted it taken down, they could do so (at their expense). Not being from the area, absent a real photo of the location it is difficult to know (e.g. is the sign on the roof of Wagner’s?) If it only next to the highway, chances are you drove by it before you can even decide to stop. Also, the sign itself is not so obvious confusion. The sign for the burger joint is separated from that of Coke. It could pass for a shared billboard in which case Wagner’s is not attempting to pass off its offerings as those of Coke. Rather Coke is enjoying some free advertising. And, finally, while I enjoyed learning a great deal from Professor McCarthy I have never accepted the initial confusion test nor his evil road sign example. Consumers are not stupid and are able to make a correct choice (or change their mind). If I enter a store and ask the clerk “where are the cokes” and I am directed to “Isle 29” where I find no cokes but rather the “other cola” or (God forbid) only a store brand, am I confused? Perhaps for an instant but then I am a logical consumer and can decide whether to buy the other cola or leave the store and continue my search for the “real thing”. Even if one considers the burden of having gone down to isle 29, it is not much more than consumers face every day. I think we are moving far afield from the consumer protection aspects of trademark here.